Over the period of time, social networking has become extremely popular. Everyday thousands of people are signing up for websites like MySpace, Twitter and Facebook. In May 2010, Facebook alone had more than 400 million user profiles in its network. With millions of viewers visiting every day on such sites, it is important for business portals to use this fact to their advantage. Advertising on social networking sites can prove to be very beneficial for promoting your web business. You can advertise on social networks by posting videos, pictures, links, groups, fan pages and ads. Proper management of your social networking campaign allows you to attract viewers to your own web space. The ROI of such advertising campaigns are much higher than any other form of paid advertisements. While using social network advertising, it is important to target the right audience in the right way. The kind of traffic being driven to your website can make your small online business turn into a million dollar business. People will click on links only when they are genuinely interested in finding out more about a product or service. If your ad specifies your website objectives clearly, interested viewers will surely visit your website. While advertizing or promoting your business on any of the social network, spamming should not be done at all. Spamming is completely undesirable on social networking websites. By spamming banners and links to your site, you will not get any additional visitors. In fact, you will only create a bad impression on potential customers and may also get banned from the networks. A unique feature of social network promotions is that you get to know your audience well. Social networking sites allow you to talk to people and seek their feedback on your services and products. Social networking sites have provided a new avenue to online businesses for promoting their products and services effectively. We at Centex Technologies provide complete internet marketing solutions including social networking campaigns and Search Engine Optimization. The launch of Windows SharePoint Services has made it easier for corporate organizations to ensure team collaboration through a scalable, secure, enterprise-level portal. All the information is collected and organized at a single place, making it easy to find relevant data quickly. Team members and site managers can coordinate to work on projects, documents, announcements and other activities. Single point access to information provides an integrated portal to team members. This leads to better decision-making and collaboration. Page and document changes can be instantly declared through subscribed alerts. It is very convenient and flexible for users who access the SharePoint portal with personalized content and layout. All team members can enjoy easy personal and public views of information, applications and documents. This encourages collaboration with coworkers, partners and clients. Standardized templates provide for best-practice SharePoint sites along with simplified site and document editing via integrated Microsoft Office applications. Better productivity can be achieved through SharePoint sites that get rid of time, place and technical limitations. On the other hand, team members get a reliable, affordable and flexible method of increasing productivity. Workspace site creation is also enabled through flexible user management and in-built templates. A single, password-protected site gives constant access to team information and documents. SharePoint empowers easy gathering and sharing of information, ideas, documents and communication among team members. It also has features that enable surveys’, discussions and document collaboration. Web browsers as well as client supported web services can be used to access content of the site. Individuals can locate documents, read and edit events, assignments and communicate with clients and project leaders through SharePoint. Other useful features include alerts, calendars, appointments, etc. Centex Technologies provides Web Development services for clients across the globe. Contact Us today for a free quote. 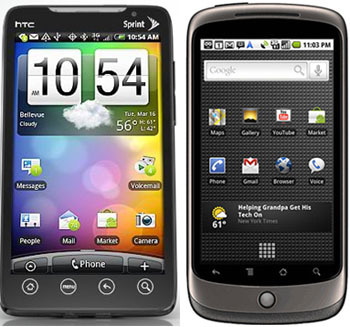 HTC EVO 4G is being termed as the best smartphone till date. Available on Sprint, it has powerful features that are enclosed in a sleek, easy-to-handle design. Priced at $200, the phone users will have to pay additional $70 for unlimited data and $10 premium data add-on for 4G use. However, 4G connectivity is present in a few US cities only. Design – With a stylish design, the phone has a 4.3-inch WVGA touchscreen, black bezel and red detailing. Larger than the regular smartphone, the EVO 4G measures 4.8” x 2.6” x 0.5” in size. It is comfortable to hold and use. The display includes the four navigation buttons, offering a minimalist look. The volume control is on the right side while the top consists of a headphone jack and power button. The bottom has the HDMI port and Micro-USB connector. Android 2.1 – HTC EVO 4G includes Android 2.1 with Sense. Touch the homescreen to see seven thumbnail versions of open pages or applications. This is great for people who want to multitask. The phone also supports social networks like Friend Stream, Facebook, Twitter and Flickr. Applications like Google Translate, Gmail, Google Talk and YouTube are also available. Multimedia – The audio quality is good and the Sense music player supports a wide range of video formats as well. Videos from YouTube can also be clearly viewed on the phone. Camera – Including an 8-megapixel camera and dual LED flash, the phone has provision for tabletop video viewing. The user interface is easy to use with advanced controls for color, white balance, exposure and other effects. The photo quality is excellent, both indoors and outdoors. Video capturing can also be done with the HTC EVO 4G camera. A 1.3-megapixel front facing camera with video recording option is also present in the phone. 4G – Sprint claims to deliver 10 times the download speed of 3G network with its 4G network. Phone users can use voice and data together and connect up to eight wi-fi supported devices to the 4G network. Speed – The HTC EVO 4G delivers solid performance and runs on Qualcomm’s 1 GHz Snapdragon processor. Applications are launched quickly and run easily. The battery lasts for a full day with moderate usage of data. For latest on Mobile Technology and Advertizing, Visit Centex Technologies.